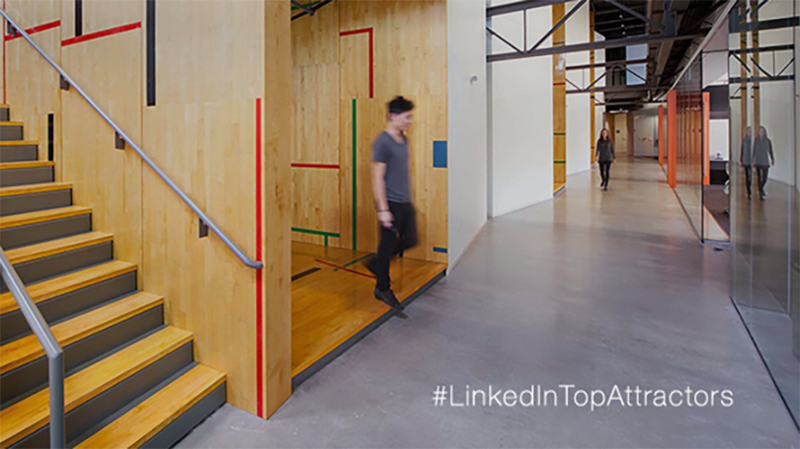 We just unveiled LinkedIn Top Attractors. It’s the first-ever list that ranks the most sought-after companies by professionals in the world right now based on the billions of actions taken on LinkedIn by our 433+ million members. Topping the U.S. list is Google, Salesforce, Facebook, Apple and Amazon. It’s no secret that competition to work at a Top Attractor is stiff, so you may be wondering how you can stand out amongst the sea of applicants at these sought-after companies. Here is some helpful advice from the companies on the list about what they look for during the hiring process. Understand the company and express your passion. Across the board, the companies on the list want candidates to be passionate about their brand and mission. Airbnb wants team players who use their service. If you’ve never stayed at an Airbnb, make sure you do so prior to applying. Before you interview at Netflix, binge watch season two of Bloodline. To learn more about their cultures and what’s important to these companies, follow them on LinkedIn. Time and time again, these companies told us they aren’t looking for candidates who fit a certain mold because they value employees with diverse skillsets and personalities. “We don't hire for ‘culture fit,’ we hire for ‘culture add,’" said Pandora. “We want our employees to bring their own unique, individual perspective to Pandora, rather than have them blend in with the pack.” A good way to showcase your personality is by publishing on LinkedIn and sharing your point of view on industry trends and news in today’s professional world. Also, make sure your LinkedIn profile reflects your personality, aspirations and skills; starting with a good photo, which is like a virtual handshake. Think ahead and be organized for job interviews. While it may seem obvious, many candidates aren’t thinking ahead. The companies on the list reinforced the importance of being prepared and doing your homework. Make sure you know your professional narrative cold. Salesforce told us that the best candidates “enthusiastically express what makes [them] tick… and align [that] with the company’s mission.” An easy way to get in right mindset is to read up on the company, see what LinkedIn Influencers in the industry are talking about and read what employees are sharing and posting. Find out what open positions are currently available at the companies on the Top Attractors list by searching for jobs on LinkedIn. To learn more about these companies and why they are sought after, visit the Top Attractors. *While we are thrilled that many people want to work with us at LinkedIn, we have removed ourselves from consideration for The LinkedIn Top Attractors list as we do with all other lists in the editorial franchise. The list still features Microsoft and was finalized prior to the announcement on June 13, 2016 that Microsoft intends to acquire LinkedIn. We will re-evaluate Microsoft’s inclusion in the future.